Help to increase your club's membership and your fund raising goals. 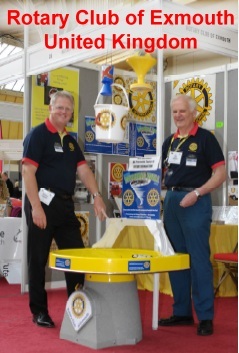 Spiral Wishing Wells have raised over $1 billion for various clubs and organizations around the world. They are the most powerful fund raising device of all time, and they do it effortlessly. People love to toss coins in and watch them spin around in circles, faster and faster until they are a blur of speed as they descend the nearly vertical walls without falling over. It is all based on simple physics, and it attracts coins from people of all ages. This is a very exciting movie clip from Japan, easily viewable from most computers. 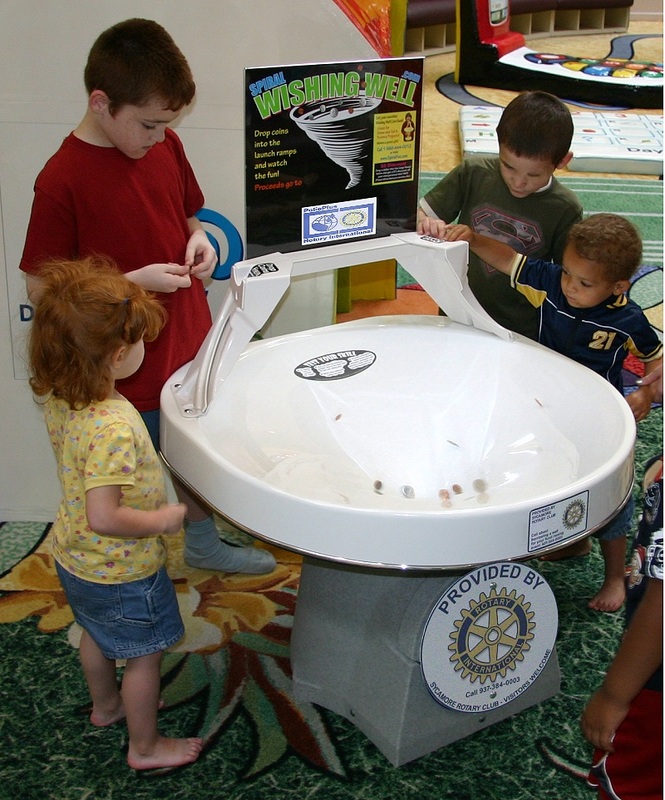 It demonstrates how children from all cultures love to watch the coins spinning. The one day income record in Japan is 75,501 yen (US$686.37)! The one day record in the USA is $40,979 set at a church. Your Service Club owns and controls the Wells. We do not receive any portion of the income, and Project Kindness has no restrictions on their use because service clubs are pre-approved. You don't have to go through an application process. A single Well has raised over $2 million in the Dayton Air Force Museum. A school raised $248,000 in 45 days for a student's life-saving bone morrow transplant. A little-known service organization in Lincoln Nebraska raised over $10 million in six years with Spiral Wishing Wells. In addition to the money raised, they are now very well known in their region. Their story is reviewed farther down on this page. 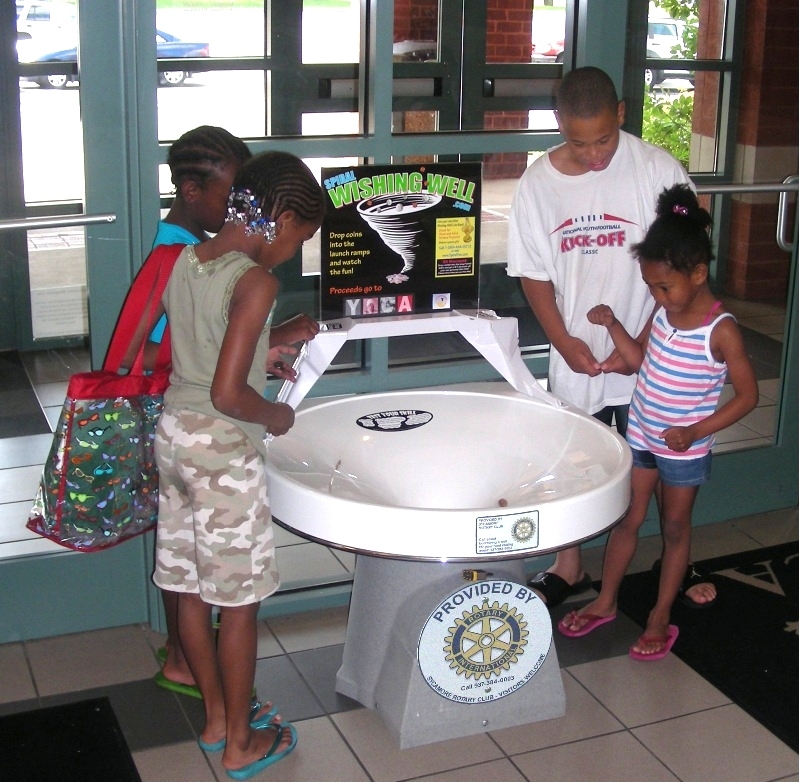 What is the "Service Club Spiral Wishing Well Program"? 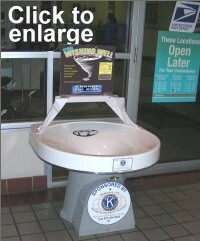 The first Well is placed in a fixed location such as a shopping mall, a Wal-Mart, a library, restaurant, bowling center, theater, or places like the locations pictured on this page. The coin revenue goes to your project, the store's designated charity, or is split between the two, as described more fully below. The second Well is to loan out to local fund raising events during the week and on weekends for a split of the coin revenue, and great exposure. Local fund raising events include church campaigns, school events such as performances and athletic games, and many other local charity fund raising activities that are held in shopping malls and other large venues. In addition to churches and schools, the number of local charities needing a Well for a day or a weekend is almost unlimited. Examples include Boys and Girls Club, Boy and Girl Scouts, Salvation Army, United Way, Humane Society, Habitat For Humanity, Lung Association, Muscular Dystrophy, American Heart Association, YMCA's, and many others. If you loan them a Well, your "Provided by Service Club" sign will be in front of hundreds and thousands of people in your community. These type of events often have media coverage, someone at a microphone, and printed programs...all of which can include specific mention of your club as the provider of the Well. 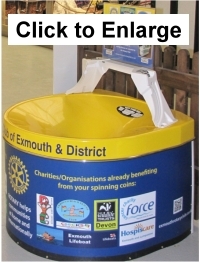 Fund raising events like this usually raise HUGE amounts of money because the events are pre-promoted and people bring all the loose coins that have been collecting in their home. They will gladly give you half the coin revenue if you loan them the Well. While the one-day record is over $40,000 at a church, a school raised $7,000 in one day, and there are many examples of $1,000 or more at one-day or weekend events. Wishing Wells are VERY profitable at events when using our word-for-word event strategy. The Well you loan out raises easy money. The church, school, or charity picks it up from you, brings it back, and hands you a check for your half! It doesn't get any easier than that. We even provide a ready-made Rental Agreement that includes ways they can maximize their income...which increases your share. 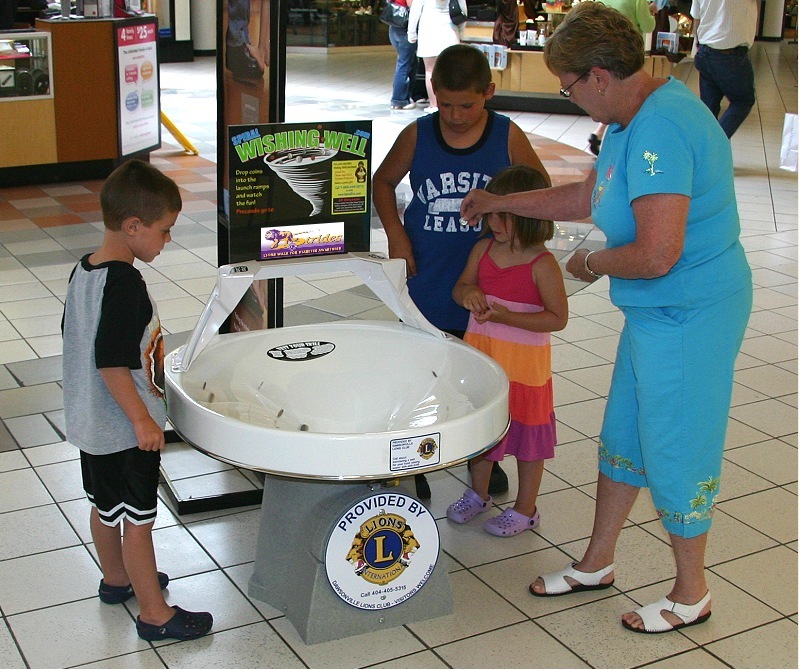 Better than Advertising: Having your Service Club logo and your club's name on Wishing Wells is better than all other forms of advertising such as radio and television ads that vaporizes into thin air when it is aired, or print ads that are tossed out with the trash. People spend several minutes at your Well, smiling and laughing as they drop in coins and read your message and invitation. Get Listed! As a result of our rental page, we receive thousands of requests from cities across the country to rent a Well for their fund raising event. If you get a Well for this purpose, WE WILL SEND THOSE INQUIRIES FROM YOUR AREA TO YOU. 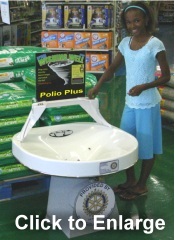 We also supply you with tools that help you let your community know that you have a Well that is available for fund raising events. 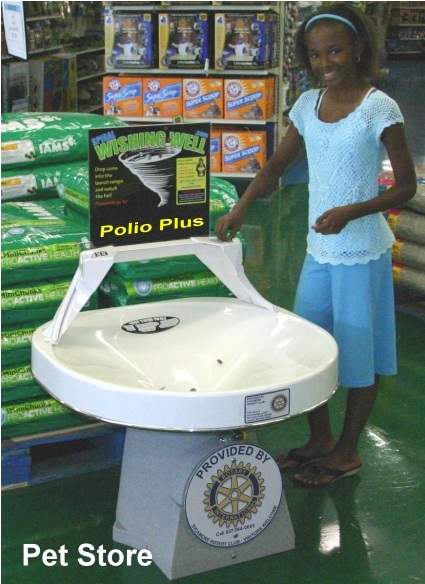 Your Well will also have a little sign on the rim that lets people know they can rent your Well for their fund raising event. So every time it is used, people from other churches, schools, and charities will see it and call you to arrange to rent it. PRESS RELEASE: Click here to see suggested wording for a press release to your local media (television, radio, newspaper, etc.) 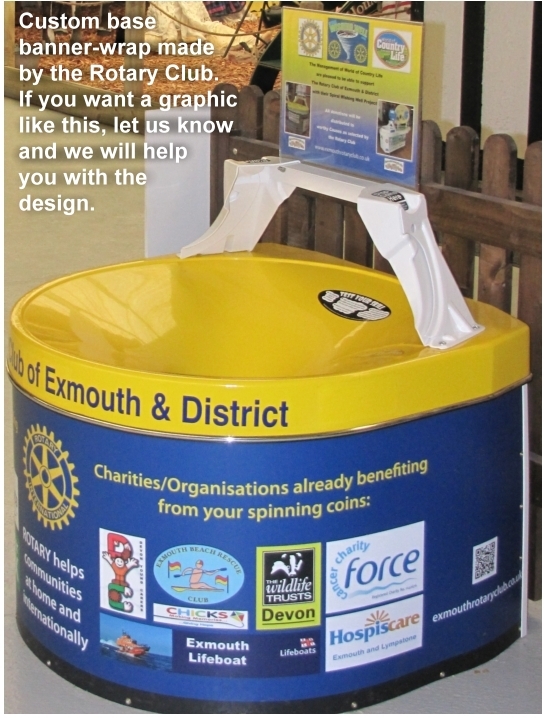 announcing that your service club, "...has a Spiral Wishing Well to loan out to local charities, churches, and schools for fund raising events..." That will kick off your exposure and start the requests coming in. 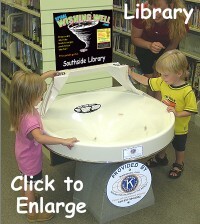 By using the second Well this way, you can easily have your Service Club Spiral Wishing Well in prominent locations every weekend and many weekday evenings, especially high school sporting events. The advertising and recruiting value will be extraordinary. Fundraising Fatigue and "The best kept secret"
1) Membership is strained from "fundraising fatigue". Member's schedules are very busy, and when they have a little time off, they want to spend it with their family. More and more of the work falls on the shoulders of the few active members. And that stresses attendance and membership. 2) Service Clubs are often "The best-kept secret" in town. Many people have heard or seen your club name, but they have no idea what you do for the community. 1) They raise money the easy way. They don't require the kind of organization and time that other fund raising efforts demand. 2) They provide public relations that tell people who you are, that you are actively involved in helping your community. It is like having billboards INSIDE the most valuable real estate in your community, and often in the media when you loan a Well for weekend events. 3) The positive public relations with your club's name and invitation on the Wells helps to draw more members. People want to be a part of something that is exciting and active. Seeing Spiral Wishing Wells in their community tells them that your club is THE organization to join. How many Wells should you place in your area? The answer depends on your goals. We encourage you to start with two and see how easy they are to place, and how much money they bring in. Armed with some experience, you can decide how many you would like to place in your community. In terms of the capacity, for a population base of 10,000 there are usually 5 to 10 "prime" locations such as a Wal-Mart or other general store, 2 or 3 grocery stores, a library, and some restaurants. Therefore, a population area of 100,000 will have at least 50 to 100 prime locations. We are not expecting Service Clubs to place Wells in all these locations, but placing 1 Well in a fixed location and renting another one out to churches, schools, and charities will be a quick and easy way to get started in any size community. This Seven-Footer was sponsored by the widow of a long-time Rotarian in Colorado, in memory of her husband, for a sister Rotary Club in Mexico. If you want to penetrate all of your area with an effective form of exclusivity, that is certainly within your reach. 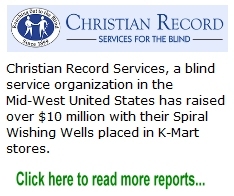 A little known organization in Lincoln Nebraska by the name of "Christian Record Services" started with three Wells and kept reinvesting the income in more and more Wells until they had several hundred of them in Lincoln and in stores up and down the Mid-West raising money to send blind children to summer camp. In fact, they got those placements because they were willing to split the revenue with the store's preferred charity. They raised over $10 million in 6 years and nearly EVERYONE in that region learned who they were. While the $10 million was fantastic, the exposure and long-term impact has also been a great benefit. Christian Record Services became one of the best-known, most active organizations in Lincoln because they placed Wells almost everywhere. The media featured stories about them a number of times, and people have learned about their service to the blind which has attracted other donors and volunteers. If you want that kind of exposure for your Service Club, it can start with just a couple of Wells. Splitting the proceeds with the store's charity! Many of the best long-term locations are part of a large chain and they already have a preferred corporate charity. Will they let you place a Well? Yes! All you have to do is offer to list their charity as the recipient on the sign above the Well, and "split" the revenue since you are providing the Well at no cost to them. That is how the blind service organization in Lincoln Nebraska raised over $10 million for blind summer camp programs. They split the coin revenue with stores. Half the revenue in a large chain store like Wal-Mart or McDonalds can be greater than 100% of the income in a smaller location. And of course, your Service Club still gets the public and media exposure as the sponsor because your "Provided by" sign is on the bottom of the Wells! Click here to see a complete word-for-word strategy about how to approach large corporate chain stores and restaurants with a revenue-sharing program. PLEASE DO NOT APPROACH OR CONTACT ANY LOCATIONS BEFORE READING THIS STRATEGY. In addition to coin revenue in the large Wells, you can raise additional revenue by giving away the small Vortx Toy Banks “FREE for a $25 to $50 donation” at various events such as pancake breakfasts, bingo, festivals, fairs, school events, church events, etc. In other words, any time you are there with your large Wishing Well, you can offer the toys so they can "Take the fun home with you." Kids love these interactive toys, and parents like the fact that they encourage saving money. So they are great birthday and Christmas gifts. They are also great for “show and tell,” and that happens every day in school as opposed to once-a-year birthdays. 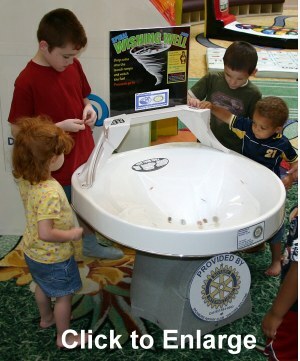 The large Spiral Wishing Wells attract attention, and you can offer the toys right there on the spot. If you have two of the floor-model Wells, you qualify for our lowest cost for the Vortx's which is $13.50 each in case quantities (25 per case). If you have one floor model Well, the toy cost is $16 each. So you can earn up to $10, $20, $30 or more with every "donation". The offer to give them away free for a donation is a LOT better than "selling" them because people will take more than one, and they will often give you more than $25 each and will not ask for change. When you loan a Spiral Wishing Well to churches, schools, and other weekend fund raising events, encourage them to do the same thing... "give away Vortx Toy Banks for a $25 or more donation" as a way to increase their income. And you can supply the Vortx's to them for a higher price and raise money with them doing all the work!Click here to read more about this extraordinary bonus income. FREE SHIPPING: We can fit up to 25 Vortx's into the open spaces of the cartons that contain the Three-Footers at NO ADDITIONAL SHIPPING COST. So if you want to get some toys to experiment with this bonus income, you can order as many as you want (up to 25) along with your Wells without any shipping cost. (This option is on the order form.) Shipping is normally $25 to $30 per case to most locations in the Continental USA. Read more about the toy banks here, including YouTube clips. We understand that clubs are cautious by nature, and that it is often difficult to get a committee to make a decision. That is the way it should be...to be careful about spending money. So most of the Service Club orders we receive are by individual members who tell us that they are speeding up the process, and will let their club reimburse them with a portion of the proceeds, or they might just donate the Wells to the club. So if you are ordering individually, you can still get the special Grants, even if you pay for the Wells with a personal check. But you must use the official Non-Profit Order Form. Click here to see Prices and Ordering steps. 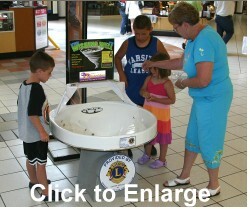 The Three-Footer model (diameter) is best for larger floor spaces such as Wal-Marts and libraries, and to loan out for local fund raising events. The Two-Footer is primarily for smaller floor-space areas such as restaurants and convenience stores. 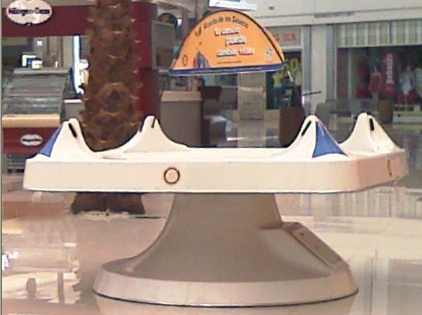 The Seven-Footer is for shopping malls and other large floor space areas. It raises the most money and gets the most exposure, but because of its much higher cost, we don't recommend that you begin with it. After you experience the income from the smaller Wells, we definitely recommend that you lock up your local shopping mall with a Seven-Footer. This will provide great income and exposure for many years to come. "We placed the first two Wells in a Super Wal-Mart. In 147 days, they have raised $2,519.38, way more than their cost. Please ship two more Wells (1 Two-Footer and 1 Three-Footer) with our 'Provided by' signs on them as soon as possible. We already have one of them committed for the Golden Coral restaurant where we hold our meetings." The "Proceeds go to" poster sign above the Well is included at no charge. You can add the project or charity and slip the poster back into the clear plastic frame. 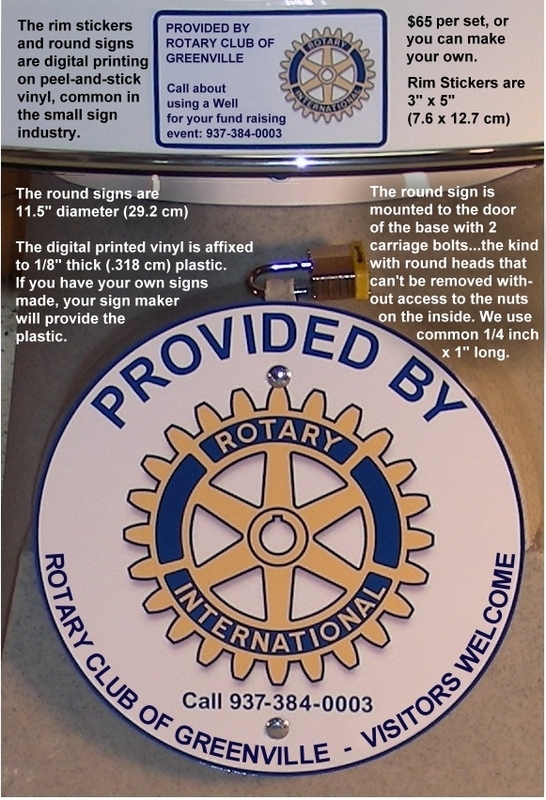 You can have the 11.5" (29.2cm) round "Provided by" sign and 3" x 5" (7.6cm x 12.7cm) rim sticker shown in the accompanying picture made at any local sign shop, or our sign maker can make it for you, and we can include the sign with your order, mounted to your Well(s). 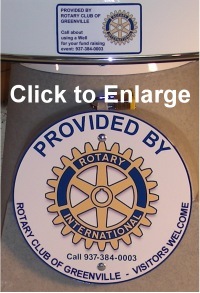 The cost is $45 for the set (round sign and rim sticker). Most sign shops charge $75 or more for this size sign and sticker, plus a set up fee, but we are happy to pass it along at cost. It is our privilege to offer the following fund raising solutions. A second Well can generate even more revenue and exposure on weekends and weekdays when loaned to local short-term fund raising events that are often covered by the media. Also, we will refer all inquiries from your area to you. Be sure to ask us if there are larger grants available for 2 or more Wells. We encourage you to review our entire website to get a broader feel of how the Spiral Wishing Wells have raised so much money over the years. For general review, we suggest you begin with the home page, which will open in a separate browser window so you don't lose this page, then click on whichever links you choose from the upper left navigation frame. We particularly encourage you to review the success stories and public programs such as museums and zoos. Please give me a phone call or an email and ask for specific information about your service club to see what programs are available. This section is a summary of the links provided above. Our goal is to provide the best ways to maximize your income. As we receive reports from other clubs, we will continue to update this page. So please check back often. Suggested Press Release wording: If you would like to have a Microsoft Word version for easy editing, please send us an email and ask for, "The Word version of the Service Club press release." Rental Agreement: This is suggested wording to use when you rent your Well to other charities and fund raising events. You will notice that it includes suggestions for how they can maximize their income. So this document is designed to give to prospective renters, and it will help convince them to rent your Well. How to maximize attended events. This information tells you how the little school in Canyonville Oregon set the current one day record of $7,352. 39. This information will help you MAXIMIZE your initial income and completely pay for your Well and a whole lot more at a single kick-off event. It takes a little planning and promotion, but is well worth it. A link to this page is included in the Rental Agreement so it will help the groups to which you rent your Well to gain confidence and to maximize their income...which of course increases your share too. You will see what we mean as you review this page.